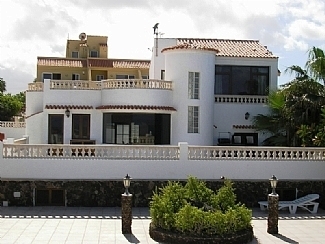 Villa Ernesto is in a wonderful location, right on the sea front in the resort of Corralejo, Fuerteventura. It is only 500 metres from the nearest sandy beach and enjoys amazing sea views. It is an impressive four bedroom villa which can sleep up to 8 people. There is a salt water swimming pool set in a walled sun terrace and surrounded with plenty of sun loungers. There is also an alfresco dining area with patio table, chairs and a barbeque. Additionally, there is a upper terrace and a roof terrace, which is accessed from the master bedroom. The villa is laid out over 2 levels, with a large living room on the ground floor with four comfortable sofas and a dining area, all of which enjoys fabulous sea views. In addition to the fully equipped kitchen, there is also a utility room with washing machine. All the bedrooms have 2 single beds, three of which are on the ground floor with the master bedroom on the upper floor. If a linen and towel change is required this can be arranged locally for 50 euros.